And if it was on the bridge, there is no practical alternate route to get downtown. That’s the problem that keeps coming up when people complain about the frequent slowdowns and traffic jams approaching the bridge. We need another bridge, they say. I got the advisory as as we were about to head into town. Should we wait until there’s an advisory that the spill is cleaned up and both lanes are open? If we had done that, we’d still be waiting, and now the sun has been down for more than an hour and our favorite downtown restaurant, the Taqueria Alonzo, is closed. Instead, we opted to take a leisurely drive through the wilds of Benton and Polk counties up to Independence and cross the river there. On the way, though, a better idea came along: the Buena Vista Ferry, which runs until 7 p.m.
Here’s an occasion once again to thank Marion County for keeping this operation going in the place where there has been a ferry since the 19th century. With money always being tight, the temptation to close this anachronism must be great. But they have resisted it, and the ferry is still going, providing a service for — I’m guessing here — maybe hundreds of people who use it every day. The crossing costs three dollars per car, more for a truck. It’s well worth the experience of being carried across the river in five minutes or less. Back to that advisory. It was the second one in three days. The first arrived at 8:41 p.m. Sunday and reached me out of town. It warned that Scenic Drive and Spring Hill Road were closed at two cross streets. “Due to the recent weather pattern there have been multiple trees and power lines down in the North Albany/Benton County area,” it said. “Recent weather pattern”? I think there had been a storm that knocked down some lines. Why not say what actually happened? And why not follow up with an advisory when the roads are open again? Advisories like this could be far more helpful if they were specific and always followed by a timely all-clear. That would be nice if they would let us know when the roads/bridge are open again. Thank you for sharing Hasso. We have family coming next month. We will be sure to use the ferry, to cross the river. Love your stories. Keep your reports coming. I too am happy the Buena Vista Ferry is still there. I recall the summer after 9th grade in Jefferson back in the 70’s. I had a nice Peugeot 10 speed bike, and at 15, would not yet have a full time summer job. That summer, I gathered night crawlers in the Jefferson Elmentary school yard at night. I would sell out early the next morning, typically before 10:00, as we lived near a busy intersection in town. The fishermen heading up to the Detroit area would drive by our house. With some lunch and pocket money, I would then take off on my bike for the rest of the summer day. 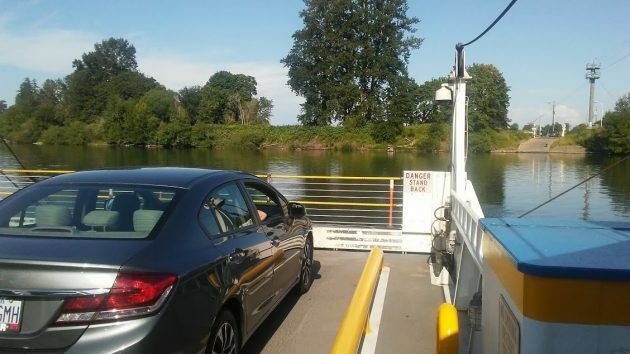 One of my favorite routes was to head out to the Buena Vista ferry, and take it across the river. Once across the river I would continue into to Monmouth where I would stop for something to eat. After that I would ride through Independence, and take the back roads into Albany, usually stopping again for liquids of some sort at some place in town. I would finish up the loop back into Jefferson. I don’t know how many times that summer I took that trip, but it was my summer of solo bike riding, and my first time exploring the back roads on my own. This was in the late 1970s’. As I recall, the ferry fee was either minimal or waived for bike riders at that time. In later summers, I started moving pipe during the summers out that way. The fields were on the Jefferson side of the river. Many days, we would park our truck on this side, and take the ferry across the river and eat our sack lunches on the other side. I don’t recall why we did that, likely just to enjoy the trip and take a break from moving pipe during the hot lunchtime hour. Yes, I hope the ferry stays operating another fifty years. We also like to use the ferry when on a little bicycle ride to Independence, riding North on the East side of the river from the ferry. Anachronisms make the universe a more interesting place. Thanks for the video. Glad the ferry is in operation. I’m signed up for Albany Police email Flashalerts and didn’t receive the messages you mention. The website associated with the alerts I get, https://www.flashalert.net/id/AlbanyPolice has the most recent alerts occurring on June 1st. Maybe you have another email alert system source than I do. The advisories came via a service the city calls Nixle. We like using the ferry and have gone on it twice this year. I went out and crossed on the old one the last day it ran. The new one is very nice and fast, not that we are ever in a hurry when we choose that route. It’s nice when in Buena Vista to stop at Buena Vista Flower’s gardens and purchase some dried flower arrangements. Paying is usually by the honor system with a mail drop slot out front. Right next door is the lovely Buena Vista House Cafe and Lodging. The cafe is open 8 a.m.-noon Thursday -Sunday featuring locally sourced food. We enjoy driving out there for breakfast.